I love the row of 1956 holiday bronze Johnson outboards in one of your photos! Hi Andreas, good to hear from you. The spray rails were originally painted and had a 1/2" aluminum half round extrusion that was kind of beat up, so I found some new aluminum that we are going to install. 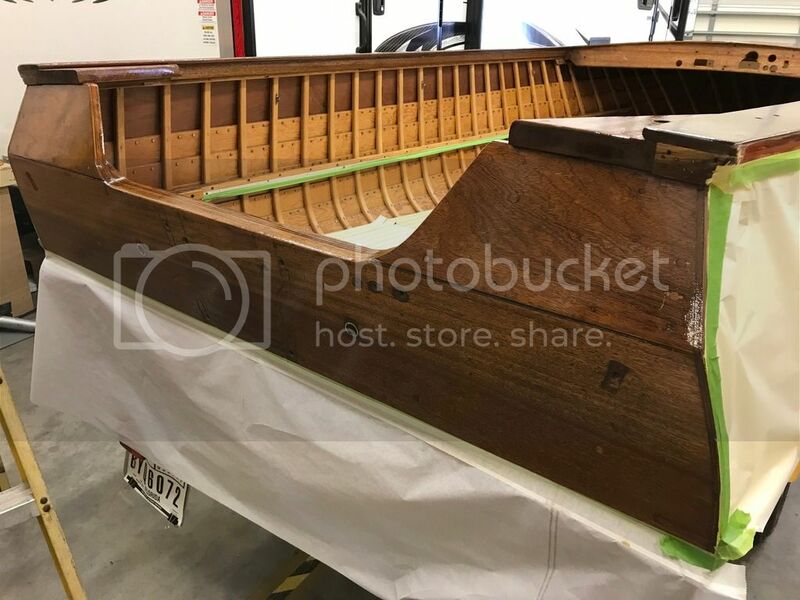 The boat also came with an aluminum gunwale rub rail with a black vinyl insert that is in really good condition so I was planning to reinstall it. It also has the rear corner aluminum castings that i was planning to reuse. The boat was originally grey and white and I want to try to keep it as original as possible but I really like the yellow. Ah OK about the painted spray rail. Yes, I try to keep he old boats as close to original as possible. 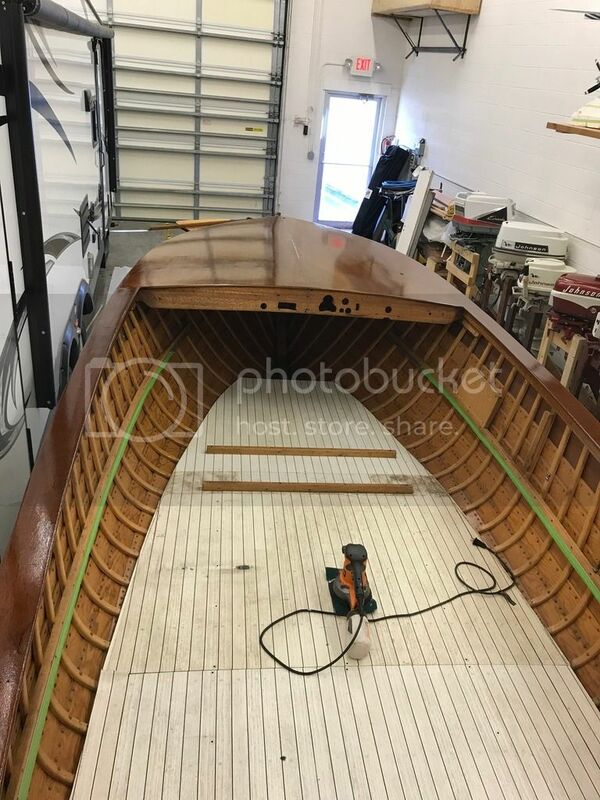 General question for anyone reading this thread: Is it possible to apply a 5200 bottom with the boat upright? Maybe thin coats so it doesn't run and hang down like stalagtites? Verne, if you are just caulking the seams like i did you shouldn't have any problems because the 5200 is pretty thick, not runny at all. According to the guy at snake mountain boat works I used way too much caulk on my boat, which in retrospect i tend to agree with. You just want a real thin bead in the seam. You could practice on some scrap wood first to see how it handles. That's encouraging. My '60 Sea Coaster leaks like a sieve and I just can't get into a whole disassembly/flipping project with it. 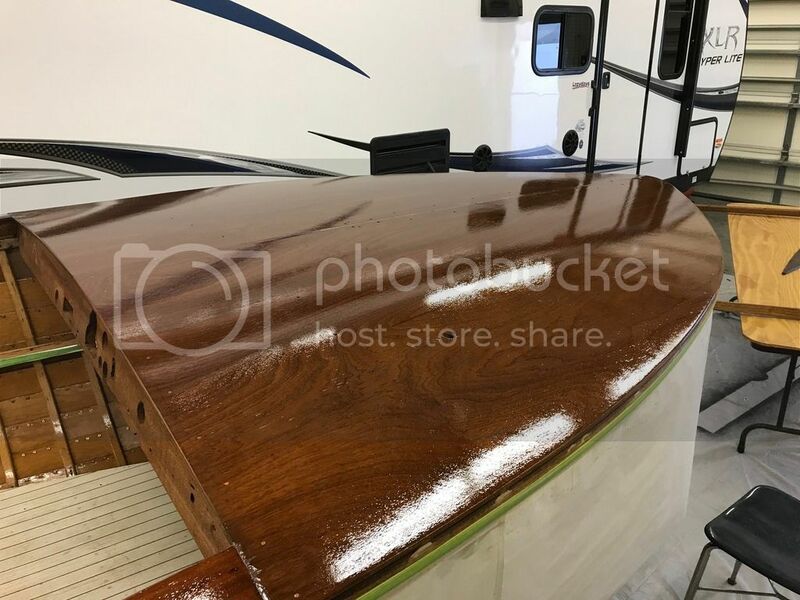 7-11 Update - When I peeled the stained white vinyl off the front deck I found beautiful mahogany plywood, so I decided to just seal with CPES and varnish. This is with 2 coats of varnish so far. Needs sanding and another couple of coats. I think there was an option on the original boat that you could either have the vinyl or varnished deck, no additional charge. The guy I bought the boat from came by our shop the other day and gave me some more info on the history of this boat. He bought it in 1988 from an 85 year old guy who had it stored in a commercial garage since new. The guy I bought it from NEVER put it in the water. He was going to restore it but never got around to it, and he said the original owner hardly ever used it. He said if the boat spent 14 days in the water it's whole life he would be surprised.